In other news I entered a couple of pictures into this competition that’s being held by Glenisk and I’ve made the final ten there too! So all in all I’m over the moon and feeling slightly guilty for not keeping up with posting recipes here this past month. A couple of weeks ago I signed up for a weekly organic veg box delivery service that’s provided in the Cork area by Organic Republic. Anyone from the area who frequents one of the many local farmers markets should be familiar with their huge stand which is laden with delicious looking veg. I decided to go with the flow and get the default box each week and so far it’s been great! 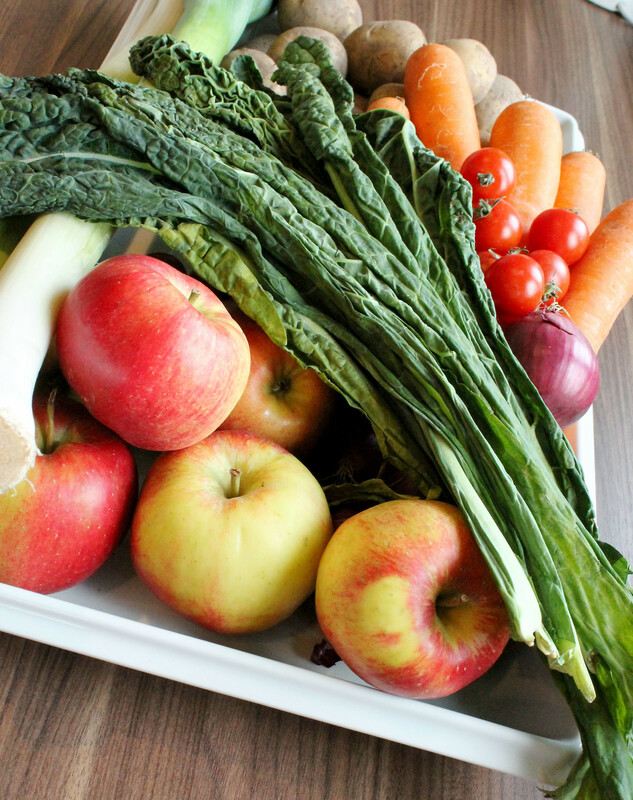 The picture below shows some of the fruit and veg that were included in the first box. Since then it has included shallots, aubergine, avocado, pointed peppers and some of the tastiest fruit I’ve ever had. The dish I’m using here was very kindly given to me by Viking Direct who offer lots of great tableware and cookware delivered directly to you. In my first week there was a large bunch of kale included and I’m embarrassed to admit that it’s something that I had never tasted. If the health and fitness boards on Pinterest are anything to go by, it’s the superest super food out there. I however am a little late to the Kale worshipping party. I was going to just throw it into a morning smoothie in place of the spinach I usually use but thanks to the google machine I made this really delicious Curried Kale and Potato Gratin instead. I’m sure that some of the health benefits of eating this leafy green were negated by cooking it using this method but it’s better than eating a bag of crisps. 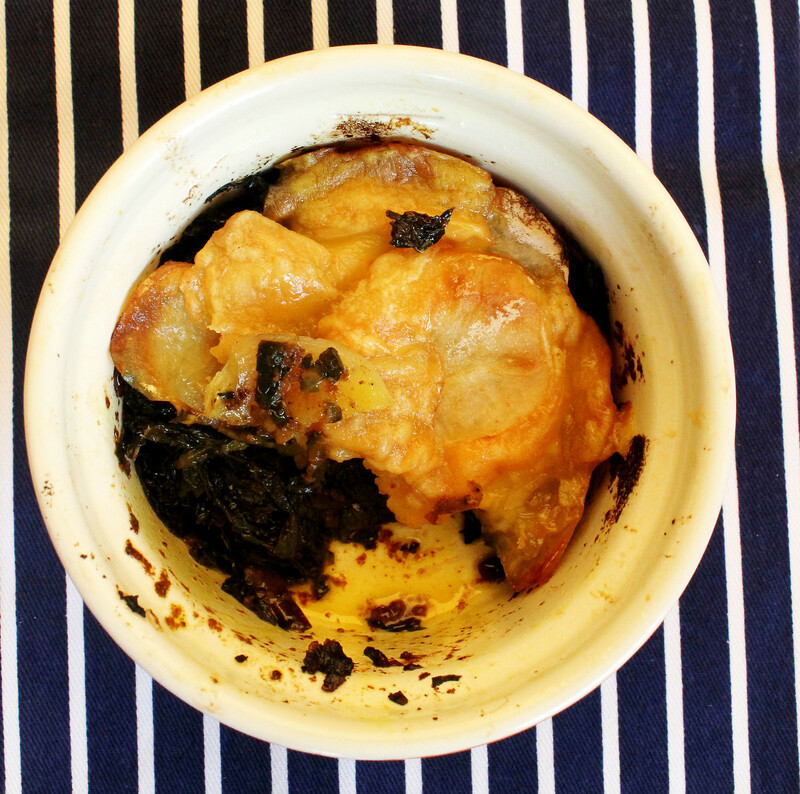 Preheat your oven to 220C and grease the baking dish you are going to use. 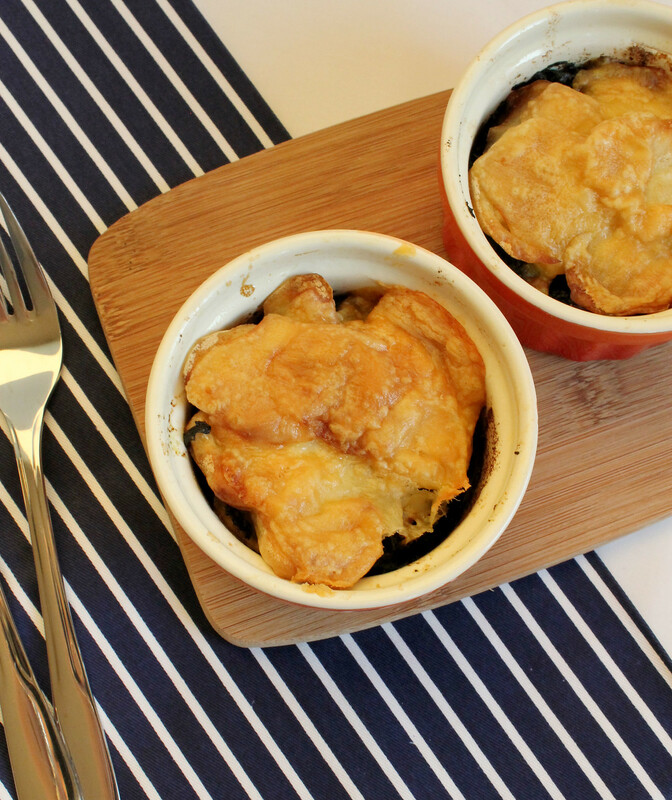 I used 4 small ramekins to make individual portions but any gratin type dish will work. If you want to keep this dairy free, lose the cheese and clarify your butter using the method here. Heat a deep frying pan over a medium heat and add the rapeseed oil. Add the finely diced onion to the pan. Once it has softened but before it starts to brown (about 5 mins), add the powdered spices. Coat the onions well this mixture and then add the chopped kale. Cover the pan and allow the kale to soften and wilt, stir every couple of minutes so that it soaks up all of the onion and spice mix. It should be ready in about 8-10 minutes. 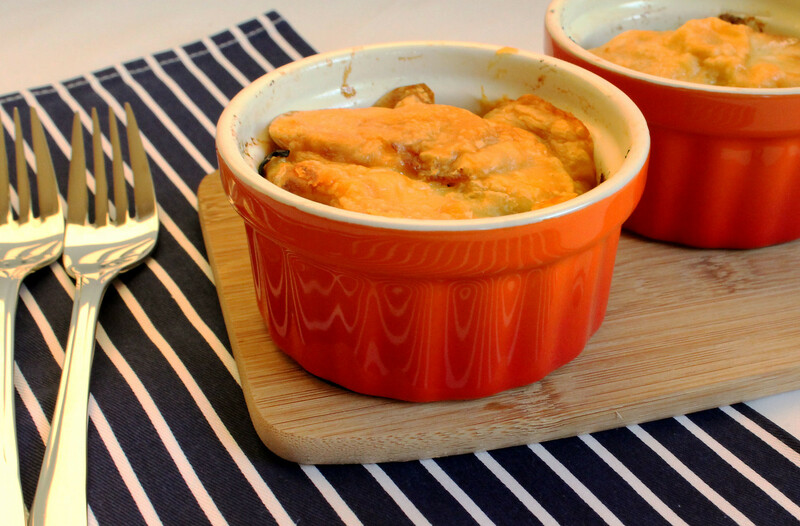 Place alternate layers of the potato slices and kale mixture into the baking dishes. Melt the butter and pour over the layered mixture. Place in the oven for about 30 minutes. Take out, sprinkle the cheese on top if using and put back in the oven to melt, it should take about 45 minutes in total for the gratin to be cooked. This would make a great side dish with some steak or grilled chicken, however it is filling and hearty enough to be a meal in itself. Although the original recipe recommends keeping this in the fridge for 3 days I found it tasted best straight out of the oven.